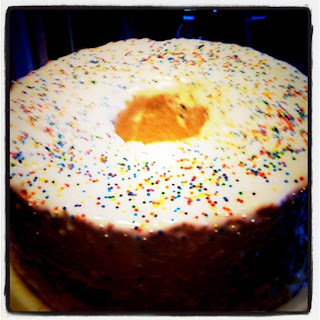 One of my strongest memories of my grandmother, Elizabeth Hutson, is how she would make an angel food cake for special occasions (or quite honestly, probably when the chickens laid some extra eggs). I still remember her whipping the egg whites by hand in a giant pottery bowl (which now sits atop my fridge) using a flat whip (yes, I still have it as well). I don't know if the secret of her cake rested in the whipped egg whites, but I know she always strived to get them whipped into soft peak submission. Saturday, during a visit home, mom said "why don't we make an angel food cake." I think mom expected me to whip the egg whites in her mixer, but subconsciously, I grabbed a large bowl and started doing it by hand. It's not that the cake wouldn't have turned out well, using the mixer, but somehow, mixing it by hand seemed, well, natural. I didn't have access to grandma's recipe (it's somewhere in a box at home), but I did have a recipe from the Almena, Kan., community cookbook. Simple - really just flour, sugar, cream of tarter, egg whites, vanilla, salt and almond flavoring - the recipe just took some extra prep to execute. Apparently, it turned out well, since everyone - especially dad - seemed to enjoy it. Getting Started: Your eggs should be a room temperature & you should use an ungreased tube cake pan. Preheat oven to 350 degrees. Step 1) Put measured sifted cake flour and 1/2 cup sifted sugar together. Sift the two ingredients together four times. Step 2) Combine egg whites, salt, cream of tarter and flavorings in a large bowl. Beat with mixer until soft peaks form. Step 3) Add the other 1-1/3 cups sifted sugar to the egg white mixture, in four additions, beating until blended each time. Step 4) Sift in flour/sugar mixture into egg whites in four additions, folding in with large spoon each time. Step 5) Fold batter into tube pan and bake at 350 degrees for 30 to 35 minutes or until lightly browned on top with a dry look. Step 6) Remove from oven, invert pan and let cake stand until cool. Remove pan and frost as desired. Somethings I learned From This Adventure In Cooking! 2) What should you do with the egg yolks (and busted eggs)? Well, we made egg noodles (and tried out mom's new pasta machine). Basically, this meant dad got homemade chicken and noodles AND an angel food cake for supper. (We made enough noodles for supper, and to freeze for at least two more meals). 3) Since we didn't have a "sifter" for the sugar and flour, I put it in a bowl and then kind of "sifted" it with a pastry cutter. I figured the sifter breaks up the "big" pieces, so the cutter seemed to do the job. If I do this again, I'll have a sifter. I think this adds air to the cake and makes it "fluffy." 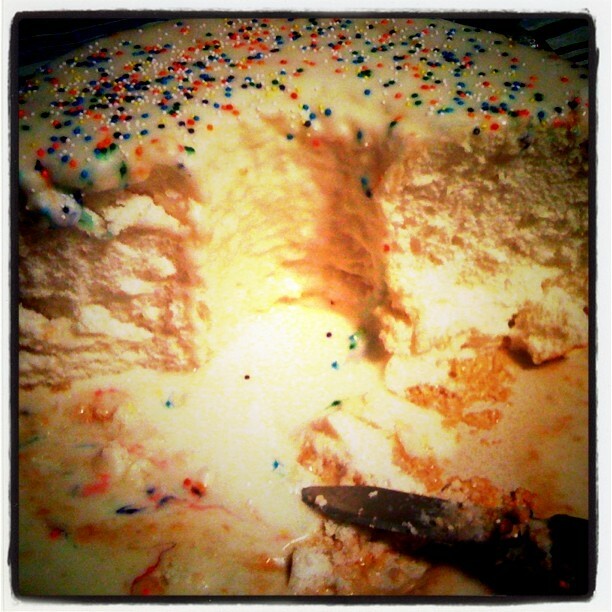 5) Make enough icing (I just did a thin powered sugar/milk/vanilla glaze) so it can pour over the cake in one setting. 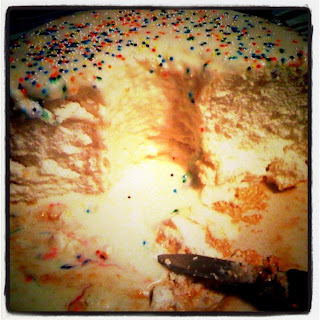 6) Colored sprinkles are "extra" but that's how grandma made it! Cool Beck, didn't know that..